En tant que serviteur passionné du Regietheater, le théâtre du metteur-en-scène, je me permets d’adapter les pièces classiques en œuvres d’art tout à fait nouvelles, qui seront en effet les versions oniriques de ces pièces. Cela m’oblige, en premier lieu, de “surcharger” mon esprit d’une pléthore de documents au sujet … et autour de la pièce, et de déchiffrer ses thèmes principaux ainsi que les corrélatifs textuels de ceux-ci. Ceci me mène à un “moment de plénitude” dans lequel une image ou une idée pour la première scène se présente à mes yeux. A ce moment-là la première version de ma production s’écrit pratiquement toute seule. Bien que cette première ébauche subisse beaucoup de modifications, elle constituera la base onirique de ma production. Ces “versions oniriques ” reposent sur une idée de base, ou épine dorsale claire du concept de l’œuvre, sur une croyance profonde dans la liberté du metteur-en-scène de remanier le texte afin qu’il puisse mieux transmettre cette idée de base, et sur une ouverture ou “disponibilité” de faire n’importe quoi qui puisse soutenir ce concept en germe. Ce processus évolue lentement durant de longs mois pendant lesquels je reste en collaboration étroite avec mon dramaturge et mon décorateur jusqu’à ce que nous arrivions à une version finale de la pièce pour les comédiens. Cette version, elle-même, évoluera pendant la période des répétitions. Restant tout à fait fidèle au texte littéral de l’auteur mais pas nécessairement à l’ordre de l’action, je crois sincèrement que ces versions oniriques représentent fidèlement l’intention de l’auteur en dépit de l’adaptation différente. During nearly four decades of my work as a director, I have concentrated almost exclusively on classics – modern and ancient – from Euripides, through Everyman, Shakespeare, Congreve, Lorca, Pirandello, Arthur Miller, Peter Weiss, Stoppard, as well as avant-garde classics such as Jarry, Vitrac, Cocteau, Apollinaire, Ernst Toller and Peter Handke. I have always referred to these productions as “adaptations” because at some point in my pre-production process I created what I tended to refer to as my “dream” of this play, and in so doing staked a claim for a kind of parallel authorship of the play based on the playwright’s original text. In the following paragraphs I will try to chronicle what is essentially unchronicable: the creative process of adapting a classic. This concept of “recreation” gives rise to two issues: the right to “recreate” any play, and the faithfulness of the adapted material to what may be loosely termed, the playwright’s intentions. On the first of these, I come down firmly on the side of the regietheater: theatre is a complex, cooperative work of art but it is the director who creates the concept and leads all the collaborators to its fruition in the performance space. Therefore, as I see it, certainly with plays that are in the public domain, directors are free to use the written play as raw material upon which they can place their own very personal grid to create their theatrical – as opposed to the literary – text. The second issue – faithfulness to the playwright’s intentions – leads into questions relating to what I might call the intrinsic coherence of great works of art. The fundamental longevity of great classics rests on the universal and timeless human resonance of their themes, which, in most cases, give them an almost magical ability to suffer almost any kind of “recreation” without losing their inner strength – as long, of course, that the recreation illuminates the text’s core concerns. Since my theatrical dreams derive from the play, and since no matter how radically I rearrange the action I almost invariably remain faithful to the words, if not the order, of playwright’s text, I hope and believe that my works bear an innate faithfulness to the author’s intentions. Each encounter with a classic is a unique event. When a director embarks on developing the concept for a new production there may be well-worn habits that kick in but so many external factors affect any given production, that it is virtually impossible to make a claim for a standard approach. 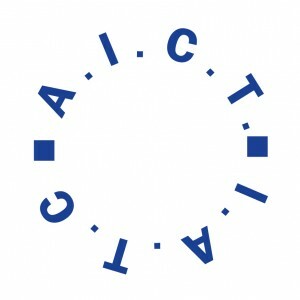 The only constants that can be singled out are: a) the absolute need to develop a clear, straightforward premise, or through-line, for the concept; b) the freedom with which the text can be rearranged to convey this premise in all its complexity; and c) the state of mind that attends this extended period of searching: an openness, an “availability” to anything that might feed into the budding concept. It is important to note, in this context, how random and often serendipitous inputs become integral elements in the production. However distant, outlandish and seemingly unconnected these images or events may be, they are culled, indeed grabbed because when they appear they intuitively satisfy the embryonic, but nonetheless powerful, concept that fills the director’s subconscious from the moment he or she chooses this particular play for production. Working on Lorca’s Blood Wedding, two outstanding features intuitively guided all my subsequent choices: a) the fact, as clearly indicated by the Mother’s opening diatribe against knives, that this is a “Tale of a Death Foretold,” and b) that the deep agenda of the play is intimately connected with Lorca’s homosexuality and his wavering between the male and the female inside him. When, by chance, instead of going to Caracas for an ITI training conference with five student actors and selected scenes from the play, I began developing a full production for all fourteen members of the class, two simple choices immediately presented themselves, neatly dovetailing into both of these main concerns: every character could be played by two actors, and the story could be released from its linear time-frame without causing undue damage to its main issues. 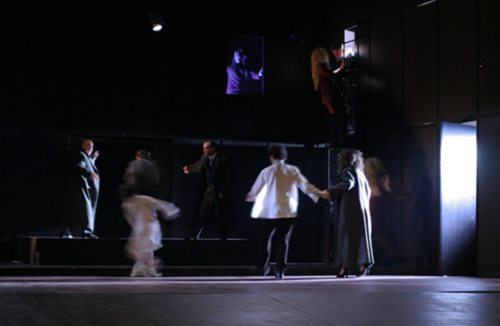 This allowed for a fractured chronology and the appearance of the doubled characters playing different sections of the play simultaneously in the performance space. These two choices, more than anything else, determined the overall concept of this production, informing it to the deepest levels of its interpretation. An example from my work on The Bacchae is another case in point. As I worked through the play I was struck by many relevant parallels to our times, but I couldn’t put my finger on the overriding theme. A chance encounter with a Kurdish-language film named Life, about the village of Halabja in Iraq which Sadam Hussein nearly wiped out with chemical bombs, brought to the fore the key that had waiting been there for me all the time: the concept of a latter-day Dionysus as a destroyer who lays waste to an entire community, from which it was but a small step to the main, totally contemporary concept: Dionysus as a charismatic religious fanatic who tears apart the social and political fabric of Thebes with wanton disregard through careful manipulation of mass hysteria. The Bacchae at the Hungarian State Theatre of Cluz, December 2004 Ferenc Sinko as Dionysos up in his cubicle, with four out of the five Agaues of the production, bearing the head of Pentheus: Imola Kezdi, Csilla Albert, Julia Albert, Emoke Boldizsar. Once again, the importance of these examples lies not in the catalysts themselves but rather in the readiness, the disponiblité, that recognizes their relevance and incorporates them in the developing scheme of a production. Given these bases, what follows here, then, is an attempt to give a structured, albeit skeletal – and very personal – account of a virtually magical process, always unique and forever unpredictable, of recreating great classics. Approaching a play in order to prepare it for production, even if it is a play one has seen or read many times, is a process that is very similar to the sculptor’s first look at a raw block of stone: the most important question is how to enter the material, where to lay the chisel and how to make the first hammer stroke. In order to find this choice spot, the first thing I do is to take in as much information as possible, circling around the text rather than in it. The historical or philosophical context of the play, research papers on the playwright and his oeuvre, biographies of the playwright, other plays by the same playwright, or plays on similar themes by other playwrights – all these enter into the budding decision. Everything taken in from any source, including random events like those mentioned above, is written down in a diary of sorts with special emphasis on the emergence of images – the first, primitive translation of the written text into some kind of visual array; how I see the play or parts of it in my imagination. Essentially this is a kind of deliberate overloading of my mind with material on, about and around the play. There is very little structure to this stage of the work – I simply pile up whatever books I think I need to read on my desk and work my way through them. During this period I also engage in a first, very preliminary textual analysis, listing the main themes of the play, and pairing them in separate files with their textual references in the play. Many of these tend to overlap, so that different theme-files often contain similar segments. In BloodWedding, for example, ten or twelve themes emerged, among them Love, Passion, Revenge, Motherhood, Fatherhood, Hate, Tradition, Gender Confusion and Indecision. In The Bacchae, one of the densest plays in the Western canon, this turned out to be an almost impossible task as the list eventually topped 25 separately recognizable themes, among them: Illusion, Spectacle, Masking, Fanaticism, Youth, Sexual Identity, Divinity, Tyranny, Hysteria, Madness, and many more, not to mention the many opposites that prompted one critic to define the play’s dynamics as a ” slippage of opposites”: divine<>mortal, male<>female, delusion<>reality, sanity<>madness, civil order<>chaos, and many more. At some point in this process there comes what I call “the moment of satiety,” when I feel I can no longer take any more in and, catalyzed into action by an image, an opening scene, or a line, all the material I have stored in my mind magically coalesces as images crystallize, theme-files present themselves, tying in almost effortlessly with the original text, and the first draft of the dream version of the play finally emerges. 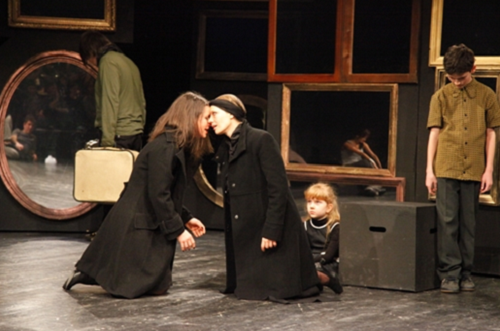 For The Dybbuk (at the Hungarian State Theatre of Cluj, Romania, 2002) three “contrary” decisions sparked the first draft. First of all, surprised by the discovery that I couldn’t remember a single Leah from all the productions I had seen because of the powerless way she had been portrayed – as a passive vessel controlled by the dybbuk rather than pro-actively drawing him in and keeping him there – I resolved to create a totally memorable Leah. Secondly, I wanted the battle between the Leah/ Hannan tandem and the religious establishment to be a fair fight, not predetermined, as in all the other productions I had seen, by pitting a helpless figure of Leah against potbellied old rabbis, with long white beards, and thunderous voices overloaded with tradition; c) I wanted Hannan to be onstage all the time, instead of disappearing after his death in the first act and coming back as an unrecognizable, disembodied voice two hours later at the end of the play. Finally, on the positive side, I wanted to put the play into its proper theatrical context as thematically related to Romeo and Juliet or Tristan and Isolde rather than to regard it as just the paradigmatic Jewish play. The result was an opening scene where the dust of centuries is being swept from the stage, and the legend is re-awakened from its slumber to be played out as an enormously powerful and tragic love story rather than as a folkloric reincarnation of the Jewishshtetl of 19th century Russia. 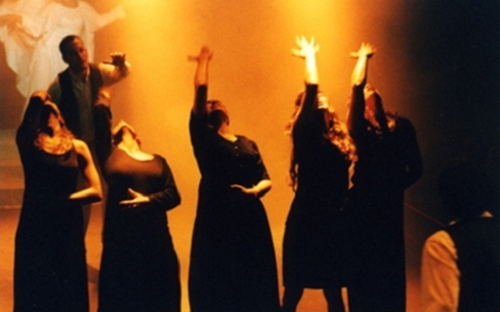 For BloodWedding (first performed at Tel Aviv University, 1995), my tragic concept of the play as “the tale of a death foretold” and my decision to rearrange the original chronology, led me to open the play with the keening of the women from the end of the play and to proceed from there poetically along a circular, double and even triple time-frame, weaving Lorca’s tragic story in a different but, I believe, totally faithful pattern. For Macbeth (at the Tamasi Aron Theatre, Svantu Gheorghe, Romania. 2006), the cardinal issues for me were the child that never was and Macbeth’s consequent lack of succession; the prevalence of evil; and the fickleness of morality. All this prompted me: a) to open the play with a child who moved through the entire play as a potent image of “non-presence;” b) to make manifest the wholesale infiltration of both Duncan’s court and Macbeth’s home by witches; and c) to conceive of a space surrounded by towering, seemingly solid walls which were in fact pocked by numerous openings through which evil was free to seep. Macbeth at the Tamasi Aron Theatre, Svantu Gheorghe, Romania, 2006. The Child is the blurred figure in the foreground; two witches are up in various openings in the walls. Once I exhaust this first rush of writing, culminating in Draft 1, this primary material undergoes numerous changes and often radical revisions before and throughout the rehearsal period, leading eventually to the final version – usually Draft 10 – that is presented onstage. For example, my concept for Six Characters in Search of an Author (at the Tompa Miklos Theatre, Targu Mures, Romania, 2010) moved in stages from a 19th-century operating theatre to a sterile, white and aluminum TV studio, and finally to a black-box rehearsal room surrounded by mirrors on rolling flats and a reorganization of the audience in the middle of the performance. A major shift occurred just prior to the beginning of rehearsals when I realized that the character I had added to the play – the “Creator” who initiates this theatrical experiment – might rashly cross the line separating reality from fantasy and decide to enter the action as Madame Pace, thus initiating a nightmarish, Stoppardian ending to the play when the entire construct of the theatre – the Six Characters and the Company – rise up against him. Some of my dream-works have also been affected by a particular understanding of the dynamics of tragedy. As I see it, we go to see classics repeatedly, among other reasons, because we entertain a recurring hope that “this time” the story will end differently; this time Hannan will not die and not need to enter Leah’s body as a dybbuk; this time Agaue will wake up from her trance on Kithairon in time to recognize her son and will not tear him limb from limb. On our way to the performance of a tragedy, we suspend not only disbelief, but also all prior knowledge in order to watch the play out of a childlike belief that all will be well. Thoughts along these lines led to the development of the mysterious character of the Meshoulakh in The Dybbuk, who, as the storyteller, wakes up the two lovers from their sleep in limbo and throughout the play tries, despairingly, ineffectually, to help their story end differently; or to the four vibrant avatars of Agaue in The Bacchae who blithely follow Dionysos into their terrible tragedy on Kithairon, followed everywhere by a ghost-like “old” Agaue, who, repeatedly experiencing the horrifying mutilation of her son by her own hand every time the play is performed, tries – unsuccessfully – to stop it from happening again. In all of the above I have temporarily put aside the crucially important issue of creative collaboration. Specifically, working with a dramaturg, a designer and the actors. Since the limits of this paper make it impossible to include the extensive work I do with actors, I have chosen to concentrate only on all the processes I undertake with my dramaturg and my designer. The concept of the active “dramaturg” is hardly known in Western theatre, yet it has become an absolutely indispensible element in the development of my productions. As an expert from the academic side of theatre, from pre-production to opening night, the dramaturg serves as a sounding board for ideas and a watchdog for the consistency of the concept, the imagery and the language. This requires “chemistry” and profound mutual respect, but when it works well it is a tremendous asset to the development of the play. I have been extraordinarily lucky in this respect as a result of my ongoing work in Romania with a brilliant young woman by the name of Kinga Kelemen who, over the course of a number of productions, has became a true collaborator of this sort, in the fullest sense of the word. Work with the designer is another kind of “dramaturgy” but one that determines the ultimate form of the production and is absolutely crucial to its development. Generally speaking, it is the designer – in most of my recent productions, my colleague Miriam Guretzky – who is the first person other than me to see the first draft. This can be as early as eight or nine months before the beginning of rehearsals. From this point on, the adaptation begins to take shape as we develop the visual concept through images, sketches, small, 1:50 “white models,” to the fully worked-out 1:25 model. The most important part of this process occurs once the basic concept of the space is clear and we have a working floor plan. 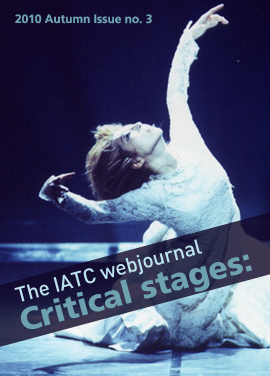 From this point we undertake a painstaking, line by line examination of the adaptation, in an attempt to visualize how the space will function; where the entrances and exits will be, and what conventions will be used to enhance the overall concept and the flow of the action. 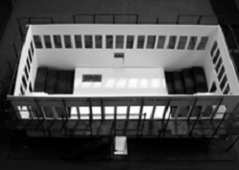 As shown in the photo above, in the first part of the play there were only four entrances, and a gallery surrounding the entire space. Within this space we had to develop the conventions that would serve a great variety of locations. 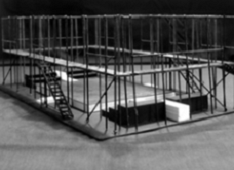 In the final act, with only the naked scaffolding left, the space became “porous” and new conventions had to be developed for this totally different space. Without going into too much detail, suffice it to say that the fundamental choice we made was that entrances and exits, and indeed, use of the entire space, would be based on fluid conventions that justified themselves briefly within each individual scene, then were immediately discarded and often never repeated. In the case ofThe Dybbuk, this process took months of intensive work, as our thinking about the dynamics of the play in that space progressed. Recreating a classic is an intimate, protracted and complex process, which is extremely difficult to compress into 3500 words. It is a hugely rewarding journey, but one that always proceeds by unique pathways, none of which resemble the other. What I hope I have managed to do here is to give a bare outline of some of the principles involved in the hope that this will shed some light on the many forms of the journey. 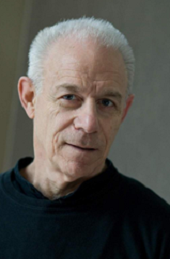 Israeli director David Zinder, Ph.D. in Dramatic Art, has a distinctive directing style and a personal method of actor training, named ImageWo. 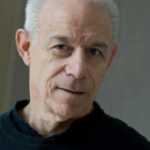 For more about David Zinder’s directing, teaching, publications and reviews, see his website at http://www.davidzinder.com/. One notable exception was a production of Lorca’s Don Perlimplin (at Cal Rep, Long Beach, California, 2006) which – ever faithful to the playwright’s words– I fleshed out by inserting many of Lorca’s own poems into the spoken text. In this vein, the following motto from King Lear appears in the final draft: “As flies to wanton boys are we to the gods, they kill us for their sport.” Discussing this production a few years ago with Richard Schechner, he remarked on the huge transformation that Dionysos had undergone from his own free-love hippy hero of Dionsyus in ’69, to my terrifyingly destructive religious fanatic of 2003. The only Leah I remembered was Hannah Rovina, the original Leah from Vakhtangov’s 1922 production with the Habima Theatre in Moscow – but that was from photographs, not from a performance. In my production, far from being a “limp vessel”, Imola Kezdi was a powerhouse Leah for which she received the Best Actress of 2002 award from the Romanian Theatre Union. Based on a fascinating MA thesis on the play called The Eye of Childhood, by Leah Zinder. Initially Miriam and I tried to create the production in an unused synagogue in Cluj, but for technical reasons we decided instead to create a similar space on the main stage of the Hungarian Theatre. The result was a variation on the structure of an Eastern European synagogue, with the upper level echoing the traditional women’s gallery. Generally speaking, my pre-production process takes between 6 to 18 months.